In 1989 Kristin was ASHA/USDF First Level Adult Amateur Champion Region 6 on her self-trained horse, Erle's Bliss, and in 1991, she was WPDA First Level Champion with Erle's Bliss with a score of 65%. Since then, she has turned her attention to training her students and helping them to be successful, and as the photos on our "Some of Our Successful Students" page shows, she has been reaching her goal. Kristin has been involved with horses since childhood, and learning dressage for over 20 years. 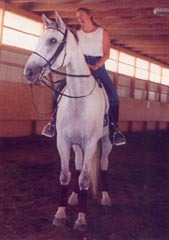 She came to Pittsburgh from New England in 1978 to train with an FEI trainer and stayed. Over the years, she has taken lessons from over 20 internationally known trainers, and produced several champion riders who show locally in dressage. Kristin herself has shown to Second Level scoring in the mid 60's. She graduated college from one of Pittsburgh's finest girls' schools, Chatham College, but has chosen to concentrate as an equestrienne. With over 40 equine articles published in national magazines, about trainers or training, Kristin has a clear way of communicating the skills needed to learn not only how to ride, but learning the technical aspects of harmonious riding such as dressage offers. Kristin has attended two of the United States Dressage Federation's teacher/ trainer seminars and the Learners Judges Program for dressage. She manages shows and clinics at Coventry and has recently formed a chapter of the Old People's Riding Club and has become an instructor for the Classical Dressage Riders Association. As a Western Pennsylvania Dressage Association board member for eight years, Kristin knows the local dressage scene. Kristin's passion is dressage and she focuses on the basics! 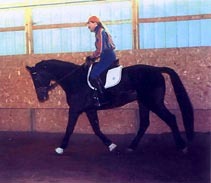 Basic dressage is a skill all riders can acquire and from which all horses benefit. She emphasizes working with the horse and is quite skilled in not only teaching, but in training her students how to train their horses. A lot of pride is taken in the fact that all her champion riders have trained themselves by taking only weekly lessons. We like to see our students be successful in the dressage show ring riding their own horses we have taught them to train themselves. This training also makes a horse more pleasant to ride even if it is not destined for the show ring, dressage or otherwise. We are proud of the fact that many of our students are successful in the dressage ring with only weekly lessons.